With final exams complete and campus becoming a little quieter than usual, days are getting longer, temperatures are inching their way upward, and all indications point to the fact that, yes, indeed “School’s Out.” Hooray! And although academia has closed many of its doors and is at rest for the summer, many University of Minnesota student groups remain open and active. The Delta Lambda Phi (DLP) Social Fraternity is one such group, and it keeps itself busy year-round. For this “School’s Out” issue of Lavender, let’s take some time out to look at just what DLP is, and how it has become the most successful social fraternity created by gay men, for all men. DLP is a social fraternity, identified through various Chapters located on University campuses across the country, and newly expanded internationally into Canada. As a social fraternity based on the Greek college model, each DLP Chapter is given its name in order of the Greek alphabet. As the fourth Chapter of DLP, the University of Minnesota location is the Delta Chapter, founded on September 28, 1988, and had its formal inauguration that same year at the Y’all Come Back Saloon! As a bit of background, the idea for what was to become the Delta Lambda Phi Social Fraternity originated in 1986 with founder Vernon L. Strickland III during the course of discussions at a party in Washington, DC. Attentive to the lack of alternative social organizations for gay men at the time, discussions that night and in the coming weeks revolved around creating a “progressive social fraternity” for men, irrespective of sexual orientation, that would be based on the college Greek model. These discussions eventually led to the founding of Delta Lambda Phi Social Fraternity. From the beginning, DLP was founded on three purposes, which continue to inform its direction and unite the Brotherhood in common values of social, service and recreational activities, and the rights of and a respect for the diversity of all individuals. Twice a year—Fall and Spring semesters—the Delta Chapter schedules its Rush period. Rush is a series of events for interested men to attend in the effort of getting to know the Delta Chapter Brothers and for the Brothers to get to know the men interested in possibly joining the fraternity. Rush events are aimed at social interactions and provide plenty of opportunity for questions, learning, and having fun. Events vary from semester to semester, but previous events have included bowling night, Mall of America mini-golf, coffee social, and a drag party. After the Rush period, bids are offered to rush participants who are determined to be the best fit with the fraternity, and once the bids are accepted, the pledge process begins. The Pledge period is a 7 week period of education about the fraternity, interaction with the Brothers, and a series of tasks assigned to the pledges to complete during the pledge process. It is all part of the process every Brother in the fraternity has committed to. 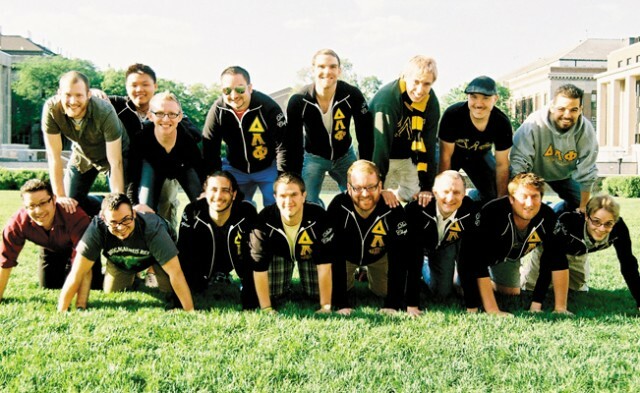 In its current form, Delta Lambda Phi has 30 Chapters. The Delta Chapter at the University of Minnesota is active with 20 Brothers and a surrounding community of supportive and engaging alumni. Though identified primarily as a social fraternity with a continuous calendar of social events, DLP Brothers make their presence known in a number of different ways through service to the local community. Service projects include volunteering at the Minnesota AIDS Project, participating in the MN AIDS Walk, and at Pride both by marching in the parade and with a booth setup in the park. These are events when the fraternity gives back to the local community and makes its presence known. Of course the future of the Delta Chapter is always a work-in-progress and is dependent upon a multitude of variables. But with strong leadership in place and an active and dynamic group of Brothers that has grown consistently over the past two years, the Delta Chapter is thriving. Goals for the future include continuing to increase the Chapter’s membership, developing an even stronger presence on the University campus, participating in additional service projects in the Twin Cities, and planning new creative and exciting events for future rush periods. All logistics aside, at the heart of DLP and what sets it apart from other organizations is its unique quality of Brotherhood. One could look up the dictionary definition of “brotherhood,” gain an intellectual knowledge of it to mean “the state or relationship of being brothers; fellowship; an association of men, such as a fraternity or union, united for common purposes,” but the actual Brotherhood experience cannot be so rigidly defined or described. Every DLP Brother has his own sense of and experience of what it means to be a Brother and each brings his own meaning of Brotherhood to the fraternity. When asked what Brotherhood means to him, Delta Chapter Brothers and Alumni describe the meaning of Brotherhood in an array of different ways, covering a full spectrum of experiences anywhere from loyalty, honor, friendship, and community to strength, trust, honesty, and integrity. To others, Brotherhood means strength in numbers, bonding, and teamwork. It means love, family, and even family-like it or not. It means standing together as a whole even when the pieces don’t fit together nicely. Brotherhood is support and unconditional love, along with laughter and acceptance, and ultimately it can be the strongest bond in life. And it is through the bonds of Brotherhood that, although school’s out at the U, for Delta Lambda Phi, Brotherhood is always in. For further information, and to learn of the Fall Semester 2012 rush at the U, please visit www.ifrat.org, or find us online at Twitter and Facebook.